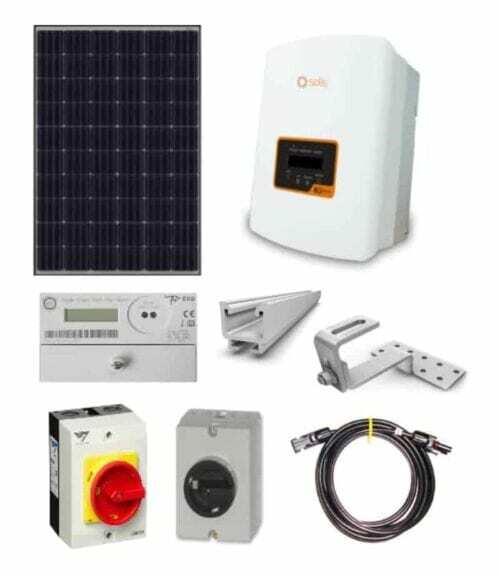 The package comes with JA Solar 280W monocrystalline panels delivered on a pallet and includes all the components you need to install your system. Available with Poly panels as well. 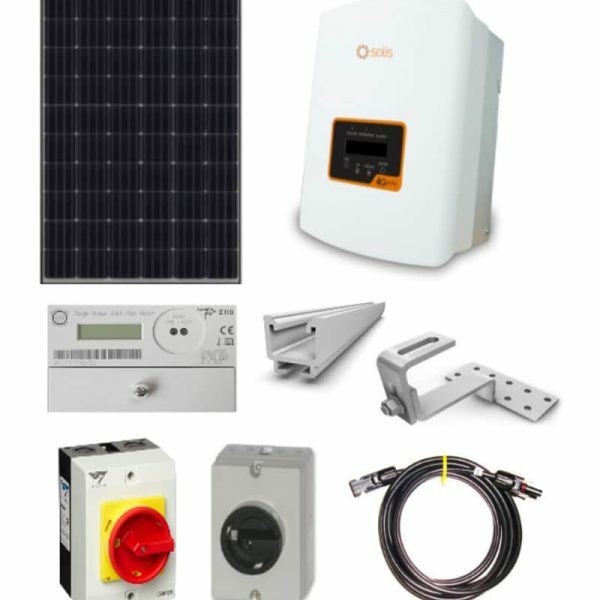 The Grid Tied All-in-One 3kw DIY Solar Package with Solis and JA Solar is an all-in-one solar kit at best price you can get. This package was specially designed for customers in the UK meeting all requirements of MCS . This Grid Tied All-in-One 3kw DIY Solar Package with Solis and JA Solar is your perfect choice to start your electricity production. This Grid Tied All-in-One 3kw DIY Solar Package with Solis and JA Solar which is not only easy to install, but also allows for quick grid connections. The high efficiency dual MPPT Solis inverter will generate you the AC Power from your solar panels which you can install on your roof with the Schletter mounting system (included in the package). All you need is just a qualified electrician to connect your solar pv system together and to your main electrical board. The JA Solar pv panels will guaranty you a 25 years reliability and also a perfect look of your roof. Optionally can be ordered with LG, Panasonic, IBC Solar, REC and Jinko solar modules as well. The Grid Tied All-in-One 3kw DIY Solar Package with Solis and JA Solar is a solar system that fits your needs. Need Help With Solar Permit Documents? Solar Permit Service (SPS). Solaranna`permit service (SPS) is offered in EU and USA – at an extra cost – as a value added service for our customers only who purchase our grid tied or off-grid solar packages of minimum 18 panels or more. The building permit SPS is available for most pf the countries in the European Union, Australia and in majority of the states in the USA to help you get through your local jurisdiction building permit process. Our team of professional designers can provide the documents, blueprints and expertise needed to work with any building department internationally or nationwide in your country. Ningbo Ginlong Technologies World Headquarters and are located in Zhejiang, China. The Ginlong Wind Products and PV Inverter Product manufacturing facilities, also located in Ningbo, feature state-of-the-art manufacturing equipment in one of the largest renewable energy equipment manufacturing facilities in Asia. The company has representatives across the globe with sales and customer service offices in Europe, the United States and Australia. Join our ZERO Home Bills Community. The BEST solar kits and solar packages from the Best Solar Energy manufacturers at the BEST Prices for ZERO Home Bills on ZEROhomebills.com by Solaranna. The package comes on a pallet and includes all the components you need to install your system. Are Microinverters worth the extra outlay?